The clock is ticking. Not just on the countdown of the new Blackberry 10, but the fact that Greg Jamison is waiting to the 11th hour in order to decide if he's going to deal with the lease agreements that the City of Glendale has set out or if he'll let it pass and hope it regroups. As it is, Gary Bettman is still rattled from the lockout and now has to put up with this. His court-ordered roommate Jim Balsillie is just mocking him without doing much of anything. 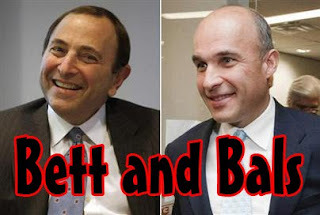 The scene is Jim Balsillie is sitting at the kitchen island, intently staring at Gary Bettman on the couch. Bettman looks around the couch to see what's behind him that Balsillie could be looking at, then starts to be come unnerved. Gary Bettman: What....what are you looking at?? GB: You know you're making me feel unsettled. GB: OKAY, OKAY!! I SHOULD HAVE SOLD YOU THE TEAM, YOU KNOW THAT?!? Jim Ballsillie (removes earbuds): What's that?? GB: YOU-- YOU SHOULD BE IN PHOENIX, THIS IS A DISASTER!! FIRST THE LOCKOUT, NOW THIS!! JB: Oh, that?? I'm over that. JB: Yeah, the Blackberry 10 is coming out and people are ready to take over the next floundering team. Phoenix is passée my man; people have their sights set on Sunrise. GB: But the Panthers aren't going anywhere....are they?? JB: That's neither here nor there-- but I like how my old company is doing something you haven't been able to do in the same time frame-- reinvent itself. Will they actually make an impact and will people actually come back to Blackberry?? Who's to say, but at least it's not the same old song and dance that the Coyotes have been giving us for years on end. GB: How can it change though?? We've had this whole thing set up for months-- Greg Jamison said we'd get this whole thing done. He had investors, but they lived somewhere else and I didn't know them. That's trustworthy enough, right?? Is it wrong to believe him?? JB: Maybe this isn't your fault-- maybe this is the City of Glendale going a little too sports crazy for a team that may not want to be there. Let's get to the brass tacks and say that Glendale thinks it's better than it actually is. This isn't a place where you'll get a lot of people to go just for the sake of seeing the place-- it's a pass-through town otherwise and they're trying to grab onto anything they can to get an identity. GB: First, it was Fehr and now it's the fear of actually having to do something again. But at least Quebec City is looking nice. They're building an arena already, even without a team-- and outside of the rainy Seattle climate, it provides a great backdrop. Winter Classics, a lot of French love, it's good times there. JB: Remember a place called Kansas City?? Remember when they built an arena with no team at all?? I remember because that was a battle ground for me. If you want to do that whole expansion thing, you'd be better off in Quebec City and get more money; but what happens first-- the silliness of Glendale gets solved or a team in Quebec City?? Seattle is doing it right-- they're making sure they have a basketball team, something they actually want, before building up a new building. GB: Right now, Kansas City could actually draw more and more than what we're doing in Glendale. At this point, I'm of the ideal that we can grease some palms and get out of this-- they have a new city council who probably doesn't want to take money from city services in order to keep a team that bilks money over and over. As much as I like the money of expansion and waiting until an arena is done-- I also like not having to deal with these people in Glendale. JB: Is this the "hill you die on" like all the other CBA hills you've frolicked in?? Are you waiting for this team to just kill itself so you don't have to make a decision and get more hate mail?? Because as much as people would love contraction-- it's not something that's going to appear, it's got to be an executive order. GB: Haters are going to hate-- so I couldn't get a damn about that. I'm just exhausted from getting a season done and now having to get a deal done because people can't get their money in order, AND I STILL GET THE BLAME?? It's a broken record and people are stupid because if I keep the team there, I'm screwing the league and if I don't move the team, I'm screwing the league. JB: Can't win for losing, big guy. (Doorbell rings) Oh, that's my BB10 prototype-- you want to answer that. GB: Oh, so this is where the T-Bomb happens?? You're going the predictable route?? JB: Just get it, stupid-- he's nowhere to be found. JB: Good job, now I have go get it fixed. What is your problem, you think everyone is after you. GB: Sorry, sorry....I'll go get it fixed. JB: You better. (Gary picks up package and walks to the car) Wait for it. (Gary opens the car door and sits down) Almost there. (Gary puts key in the ignition, starts it up). Judge Redfield T. Baum: (Jumps from the back seat) T-BOMB!!!!! JB: Long way for a tired sight-gag on a blog. It's getting harder and harder to find unique stories, but this week's could be one for the archives. This week's AGM was bounced around at the beginning and ending of his career, but when he found stability-- he shined. With a lot of team and personal awards at the end-- it's a shame he doesn't get more recongition. This week, the profile of Jim McLeod. McLeod started in the 1955-56 season with the semi-pro Port Arthur Bearcats, then moved onto the Vernon Canadians from the 1956-57 season until the 1959-60 season totalling up 56 games in the span (no records given), then was loaned out to the Kelowna Packers for the 1960 Allan Cup playdown rounds, where he would go 0-3 in those games. Turning pro in the 1960-61 season, McLeod played for the IHL's Muskegon Zephyrs for 62 games (no record), then would go 5-8 in 13 playoff games. McLeod got called up by the WHL's Seattle Totems for seven games with a 5-2-0 record. Returning to Muskegon for the 1961-62 season, McLeod would play 47 games, then go 8-1 in the playoffs-- helping Muskegon to the Turner Cup. McLeod again went to play for the Totems, going 6-6-0 in 12 games. McLeod would roam around the WHL for the next two season, playing in the 1962-63 season with the San Francisco Seals and finished with a 43-23-1 record, then he would go 10-7 in 17 playoff games, helping them win the Lester Patrick Cup. The 1963-64 season had McLeod go down the coast to play for the Los Angeles Blades in the 1963-64 season, finishing 18-15-6 in 38 games, then going 2-2 in five playoff games. Getting some stability for the time, McLeod would play for the Seattle Totems again in the 1964-65 season, where he would go 35-27-3 in 65 games, then 3-4 in the playoffs. McLeod would win the Leading Goaltender Award in the WHL. With the Totems in the 1965-66 season, McLeod would play in 46 games and post a 20-23-2 record, while going 26-11-4 in 42 games for the 1966-67 season, then 6-2 in the playoffs, leading the Totems to the Patrick Cup. McLeod would win another Leading Goaltender Award after the season. The Totems traded McLeod before the 1967-68 season, to the Portland Buckaroos, where McLeod would go 18-10-4 in 33 games, then 4-3 in the playoffs on his way to another Leading Goaltender Award, splitting with Marv Edwards. McLeod got back into it with Portland in the 1968-69 season, playing in 42 games and registering a 23-9-8 record, then 4-3 in the playoffs. Another split Leading Goaltender Award, this time with Dave Kelly was to be had. Playing only 33 games in 1969-70, McLeod went 21-9-0 before going 5-4 in the playoffs; while during the 1970-71 season, McLeod had a 32-10-3 record in 47 contests, then 8-3 in the playoffs helping Portland to win the Patrick Cup. McLeod and Kelly would split the Leading Goaltender Award that year. During the 1971 Intraleague Draft, the St. Louis Blues picked up McLeod to go with the rest of their goalie in their system. McLeod did get into 16 games for the Blues in the 1971-72 season and put up a 6-6-4 record. McLeod would return to Portland later in the season and play 13 games with a 9-3-0 record, before going 5-6 in the playoffs. With the WHA coming around, McLeod got swiped up by the Chicago Cougars in their Draft and would go 22-25-2 in the 1972-73 season. The Cougars would trade McLeod to the New York/New Jersey Raiders for the 1973-74 season, where McLeod posted a 3-7-0 record in 10 games before being traded to the Los Angeles Sharks, in which McLeod posted a 4-13-0 record in 17 games. The 1974-75 season was a wild one for McLeod-- the Sharks relocated to Michigan and became the Stag, where he would go 3-6-1 in 16 games. Then McLeod moved to the North American Pro League's Syracuse Blazers when the Stags moved to Baltimore and with the Blazers, McLeod played in three games, winning them all. Finally that year, McLeod played two games with the Greensboro Generals of the Southern Hockey League, but no record is provided. While he was bounced around from team to team at the beginning and end of his career, McLeod did win multiple top goalie awards, won the same championship with three different teams, and still managed to get some professional games in, as short of a time that it was. Not so bad for a guy who will go under the radar for most people out there. 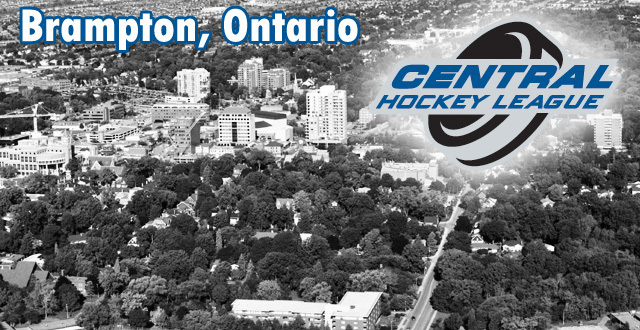 Word on Wednesday was that the Central Hockey League had reached an agreement with owners in Brampton, Ontario to bring a CHL team to the Brampton area. Brampton had recently lost their Major Junior team to North Bay, Ontario for next season; but a group stepped up and will have another league to add to the Greater Toronto Area. This should set off red flags all around, however. The Central League is one that actually had some geographic setting when it started, playing in the middle of the US, starting in Texas, Oklahoma, Kansas, and Mississippi. While they did branch out to other states bordering the area (New Mexico, Arizona, Georgia), they always went really far east in North Carolina, Tennessee, and even going so far as Youngstown, Ohio for a crazy three season road trip for some teams and for the old team itself. While they have taken over most of the midwest market by absorbing the old United Hockey League territories in Illinois and Indiana, the travel doesn't seem to be too much of some teams financially, but Brampton could be the next Youngstown of the league. The closest team to the new Brampton team would be the Bloomington Blaze, who are a 10-hour trek away according to Stadium Journey. This would also mean a lot of travel for not only the Brampton team, but also the teams they have to play who have to find a way to deal with the travel up there and coming with the finances to make those trips work and still have enough to operate during the rest of the season. 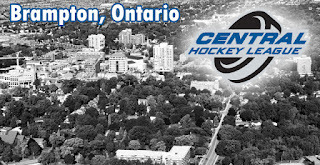 The idea of actually have a wider brand reach for the Central League is smart, but the it's a matter of whether or not fans will turn out for low-AA hockey or not that will make the Brampton team successful, which is another issue on top of travel for the team. Is getting the exposure to the Canadian side of things worth alienating or hurting the league's other teams?? Or is this something the CHL has though of and talked about with their member teams in order to figure out whether or not it was a viable option or not. Of course, the fact of the matter is the former of that last statement is probably more accurate. If a new expansion team is going to bring in some money in fees and spread it out across the league-- odds are people would be agreeing with it even if they personally don't like it. It'd help the health of the league for the short-term, but the long-term viability could be dicey at best, especially for a team like the Rapid City (SD) Rush. The upside is that the further markets-- Denver and Arizona-- are near some international airports, so it's not like they couldn't a flight-- but at the same time, that would be much more costly for them. Whether or not the addition of Brampton and St. Charles, Missouri will break up the CHL into two six-team conferences and break-up travel for the Western teams, but it could be a brief concern for the people in charge. Canada is hockey crazy for the most part, but whether or not they'll be accepting of a lower minor league over a junior team or higher minor league remains to be seen. It's good to see that the CHL is trying to expand themselves and leave their mark on the hockey landscape, but they already had one misstep in going too far east with teams in the past-- who knows if they can afford to have another. While the shortened season does leave little room for error, the fact that some fans and some teams are hovering their hands over the panic buttons may be a little too premature. Sure, the fact some teams have gotten into slumps in the early five-days for play, you just have to look back into history to see that getting off to a slow start isn't a horrible thing....if you have the right parts, of course. 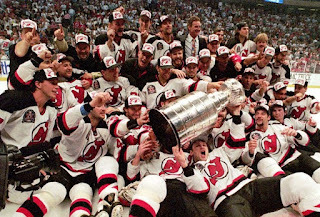 Looking at the last shortened season in 1995, you just have to look at the Stanley Cup champions of that year to see that as long as you get into the playoffs-- it's perfectly fine and you have a shot at winning the whole thing. In fact, the Devils were the 5th seed in the East, having to defeat the 4th, 3rd, and 2nd seeds in the East to win that conference in a total of 16 games before the Finals. Yet, the bigger thing is that it wasn't until March 30th (Game 33) when they went over .500 for the season and leading to their 22-18-8 record; in a time where the OT loss didn't account for a point. More over than that, after tying their first game, the Devils went to lose three straight and were 3-5-2 in their first 10 and their longest unbeaten streak was seven games It wasn't a cause for overpanic, but I'm sure it was there after the quick losing streak. Conversely, the Western Conference representitve that year was the Detroit Red Wings, who won the Presidents' Trophy for best record of the league (33-11-4) and played in 14 games before the Finals, to be swept by the Devils in four games. Comparing the stats for the Red Wings to the Devils, the Wings never dipped below .500 after January 24th in their third game of the year, went 7-3-0 in their first ten games with a long-unbeaten streak of 11 games. Interestingly enough, both teams went 5-4-1 in their last ten games. What does it all mean?? Well, it's an issue of conservation and patience. While the beginning may look grim to some fans, owners, GMs, etc. ; the fact remains that in the last short-season, it didn't really matter the quick start you got off to or not; just making the playoffs was enough to give a team hope. Of course, with the game changing in conditioning and technology; teams may want to not wait as long as March 30th to finally crack the .500 mark. Bourque started in the youth system of his native Moncton, Nova Scotia-- playing for the Moncton St. Mary's in the 1928-29 season, going 3-2-1 in six games; while in the 1929-30 season, he has the same record. In the 1930-31 season, Bourque traveled all over Moncton, playing with the junior team (Moncton CCJA: 3-1-0), another local minor hockey team (Moncton CNR Machinist: 1-1-0), and his high school squad (Moncton Aberdeens: 4-0-0, two shutouts). 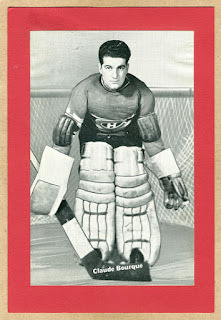 Bourque only played for CCJA in the 1931-32 season, posting a 6-0-0 record in six games, then going 2-1 in the playoffs. The 1932-33 season had Bourque suit up for the Moncton Red Indians in the MCJHL and have a 4-0-1 record in five games, then 2-0 in the playoffs, while going 6-1-1 in the Memorial Cup tournament, missing out on the final series. 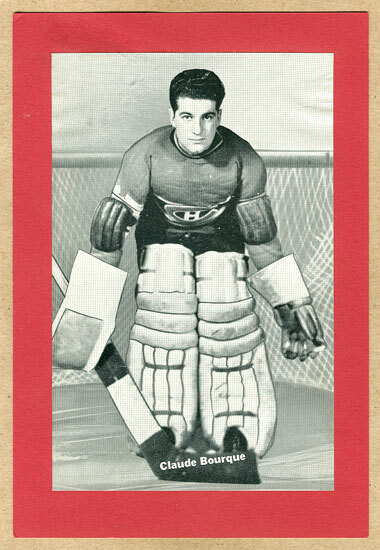 For the 1933-34 season and 1934-35 season, Bourque played for the Montreal Jr. Canadiens for 18 games, while the 1935-36 saw him play 21 games for the Sr. Canadiens, then 19 games for the Montreal Royals in the 1936-37 season. Bourque would then have his lower league tour end with the Verdun Maple Leafs in the 1937-38 season for 18 games. The Montreal Maroons owned the NHL rights to Bourque, but as they were going through financial turmoil, they traded his contract to the Montreal Canadiens, who would put him to work in the 1938-39 season-- playing in 25 games and finishing with a 7-13-5 record. 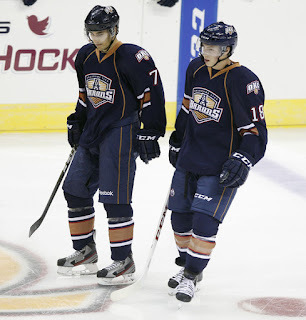 Also that season, Bourque spent two games with Verdun, then three with the Kansas City Greyhounds-- all of those losses. The Canadiens brought Bourque back up for the 1939-40 season, playing him in 36 games and having him end up with a 9-24-3 record. The Habs loaned Bourque to the Red Wings for a game to replace injured Tiny Thompson (a loss) before sending him to the New Haven Eagles, playing in six games with a 1-5-0 record. The Habs traded Bourque to the New York Rangers in the spring of 1940 and the Rangers sent him to the AHL's Philadelphia Ramblers, where Bourque would play in 56 games and finish with a 25-25-6 record. In the 1941-42 season, Bourque stayed in the AHL, but played for the Buffalo Bisons, compiling a 24-24-5 record in 54 games. After that season, Bourque enlisted with the Royal Canadian Air Force and would play with the team at the base he was stationed at, Lachine RCAF and play in 34 games, as well as 12 playoff games, before hanging up the pads for good. Bourque passed away in May of 1982. While he was bounced around Nova Scotia before getting into some bad NHL situations, it seemed that Bourque was willing to play on and was getting better before he went to war. It was a hard time to get a goaltending job in the NHL, which probably didn't help any confidence or need for stability in Bourque's career. There's been a couple of slips, as the Denver Cutthroats in the CHL and the Fort Wayne Komets have lost a little ground since the last check-in, but the Sherbrooke Phoenix are trying to rise from the expansion ashes and are currently in the last playoff spot of the QMJHL. Even the Evansville IceMen are making a small charge, so who knows what could happen down the stretch. We're a day away from the NHL season and everyone seems to be ready to somehow play Nostradamus and predict a shortened-season. I know we at the Face Off Hockey Show did last week on the show, but we have to take it to the science of things. Using Mascotopia Memory Blocks and my six-year-old kid, we've got our most scientific thing yet. Just like we should do with most things-- random selection will be the option for the day. 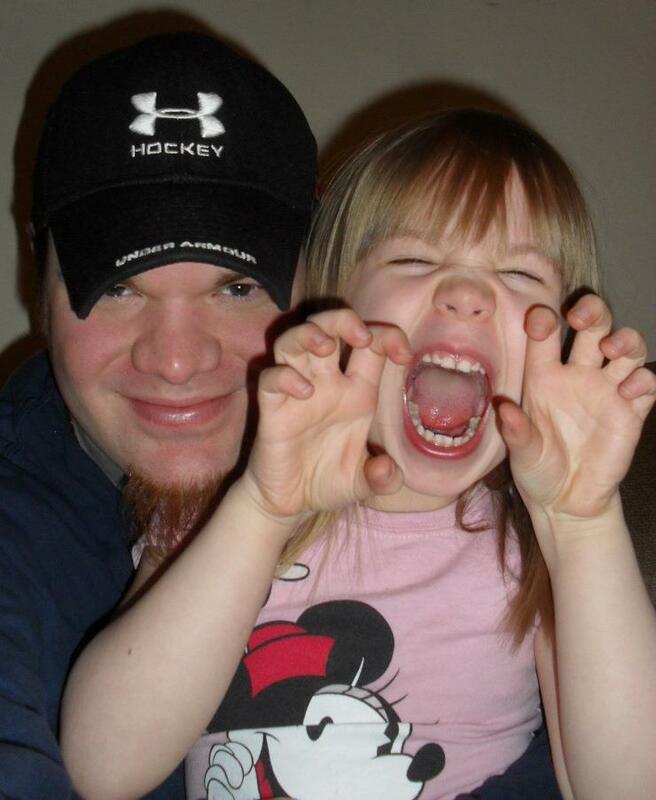 Without any further adieu, Kaity 'Beth (AKA Kegger) will make the picks for the Stanley Cup this June. Enjoy. There you have it--if you can't trust a six-year-old with picks, who can you trust?? With the NHL season about to start, other people are doing previews or rehashing the ones that they did in September for the impending NHL season then. However, with a whole new element of a short season being brought into the mix, what can you as a fan look forward to?? For me, here's the underlying factors that could play a big role into the short season. -Other Work Paying Off: The teams that had their players play either overseas or in the North American minor leagues will have a nice little jump start. They actually had game experience and have their legs about them. While the training camps will give them some rest and maybe slow them down for a short time, the fact they have had the game pace experience rather than informal practices-- those guys will have a jump; which will result in some interesting scoring leaders. -Injuries Akimbo: Expect the injury reports to have a lot of "Groin" explanations next to it. We've seen it already from some players-- Jarome Iginla and Brooks Laich-- which will definitely make some guys stretch out more or even play with a little less reckless abandon. It could also let the players who had playing time expose those with less experience. -More Urgency: Teams will not be able to have a down-swing in their game. Any kind of losing streak could mean the playoffs for these teams, which may expand the whole "parity" thing that the NHL has wanted from the 2004-05 lockout. You will probably a lot of more mix-up in lines or changes in game plans from the coaches if something needs to change, which could spark the team or throw them off their game completely. -Less Urgency: If nothing else, we could see a lot more overtime/shootout games this season. As my buddy Dearen of Mr. Mikes in Airdrie said to me this past weekend, if there's a tie game in the third, you can see a lot of teams playing to preserve the point. That could happen in the front end of the season, but since it's all Conference play, later in the season-- you could probably see more risk from teams outside of the playoffs-- but expect some boring hockey in the third for teams not wanting to give up any points that are available. That's four of probably many broad storylines out there I can see. I'm sure there's a lot more and people will expose the more intricate ones, but I'm not about being intricate. Plus, most importantly-- these will now not happen because I've put them out there. Unity is the theme for this week's AGM. He's a guy who stuck with the people who brought him up and didn't forget that, even in the wild world of hockey where you would stab your own mother in the back to get a roster spot. This week's AGM was someone who wanted to play, but under the right conditions. This week, the profile of Steve Baker. Baker started his career when he played in Ontario Junior "B" with the Owen Sound Jr. Greys, where he would play 22 games in the 1974-75 season. During then, he was recruited by Union College coach Ned Harkness, where he would attending starting in the 1975-76 season; a season where Baker played in nine games and went 8-1-0. 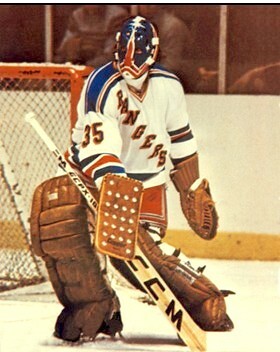 With Union in the 1976-77 season, Baker would play in 19 games with a 16-3-0 record, which lead him to getting drafted by the New York Rangers in the third round. In part of the 1977-78 season; Baker would go 3-1-1 in five games before Union College fell apart. Handcuffed by Union College's president suspending player for academic issues-- something that Harkness was told wouldn't be an issue-- Harkness left the team. Baker, along with other players, left Union College; leaving that team to finish out the season with their JV roster. The president of Union resigned after that year. For the rest of the 1977-78 season, Baker went professional and played with the Toledo Golddiggers for 10 games that year. The Rangers place Baker in the AHL with the New Haven Nighthawks for the 1978-79 season, where he would finish with a 15-5-4 record and would go 2-3 in the playoffs. The Rangers went with Baker in the 1979-80 season, where Baker would lose only one of his first ten games. However, he would finish out that season in New York with a 9-8-6 record in 27 contests. Baker spent nine games in New Haven that year with a 6-1-1 record. Baker started the 1980-81 season with New Haven, playing in 25 games and finishing with a 10-11-4 record before being called up to the Rangers, playing in 21 games and posting a 10-6-5 record; then going 7-7 in the playoffs. The 1981-82 season saw Baker start with Team USA in the Canada Cup, where he would see one game-- a tie. 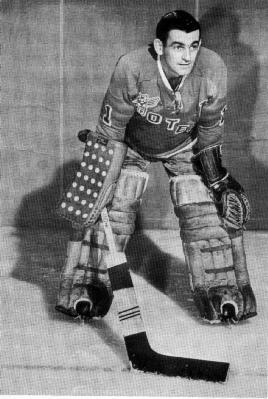 Baker then went to the AHL's Springfield Indians where he would compile a 2-7-1 record in 11 games, then go on to post a 1-5-0 record in six games with the Rangers. The 1982-83 season saw Baker play a bulk of is games in the Central League with the Tulsa Oilers, finishing there with a 22-27-0 record in 49 games, while getting called up to the Rangers for three games, finishing with a disappointing 0-1-0 record. For the 1983-84 season, Baker would go to the AHL with the Binghamton Whalers, playing in six games with a 0-4-1 record before being moved to the Maine Mariners, posting a 5-5-2 record in 13 games, then going 3-3 in the playoffs, on the way to Maine winning the Calder Cup. After that season, Baker would hang up his pads. After hockey, Baker went to finish is degree in Economics at Union College, going into advertising with Fox Sports Net, as well as scouting for the Tampa Bay Lightning for a short time. While standing up for what was right in college, Baker did get bounced around in his short career. Promising in New York, which quickly went to the wayside. The ups and downs of is consistency was something that really was the back-breaker for Baker's staying power. 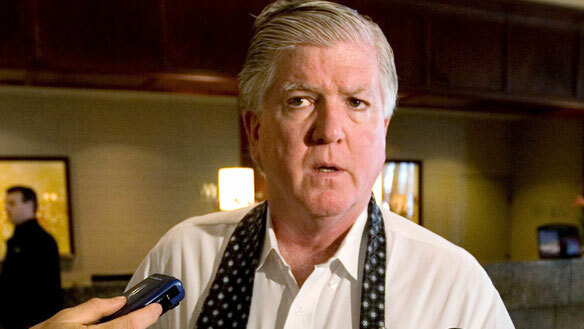 Reportedly, the Toronto Maple Leafs fired their GM Brian Burke. It was reported by Bob McKenzie and seconded by Nick Kypreos, two men who are not only in-tune the Toronto media, but hockey media overall. While the timing of this is very odd and the reports of why it happened is unknown....this is something that many owners should look at if they are unhappy with their GM. The Burke name brings along a sense of attention, a sense of belonging, and a sense of change. There's one place that needs it the most and a place where I think Burke would thrive in with basically carte blanche-- Columbus. Scott Howson has been a bit of a wreck for the Blue Jackets and the change of culture in Columbus with John Davidson coming into the fold could mean that Howson's days are numbered, especially after dealing their franchise player over the summer. Davidson and Burke are two powerful hockey guys and while they may have differences of opinion at times-- they both want to win and would do a lot in order to do so. 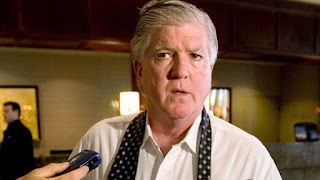 In a market like Columbus that could use a nice shot in the arm when it comes to loving professional hockey again, Brian Burke can create that. He'd be able to have some buzz around the team, get some players to come in and play for him, and put the right people in place in order to actually make it a great market. Plus, Burke has an idea of what to do in Ohio, as he late son Brendan attended Miami University in Oxford, Ohio. Should Burke decide to wait it out until a better job comes along, TV would be the best bet for him. He doesn't have the big energy as some other personalities, his dry delivery and no-nonsense persona will make him a TV darling. He has done it once before at TSN when he was out of a job and the fans seemed to enjoy his take and the way he handle things when the camera was on him. His history from being in and out of the game is invaluable. Whatever Burke chooses is something that people will keep an eye on and give attention to when he makes a decision one way or another. He's a persona the game cannot afford to let out of the limelight, especially not now. With the NHL lockout resolved, the big things to get to are ratification and getting players back into camps and what-not. This may means dragging guys back from Europe or pulling them up for the minor leagues. This, of course, creates a trickle-down theory of minor league teams getting hurt in the process and having their team maybe lose a step here and there. Of course, the tome of the Oklahoma City Barons have been one that has been followed this lockout because of players like Justin Schultz, Taylor Hall, Ryan Nugent-Hopkins, and Jordan Eberle gracing the OKC ice, but with the absence of those four-- what will happen with the Barons. While they sit 7th in the Western Conference, they lose 65 of their 115 goals from those four and it immediate vaults Mark Arcobello as the team's leading scorer. With a team who is only +7 in the goals for/against column, this adjustment could be a rough one. 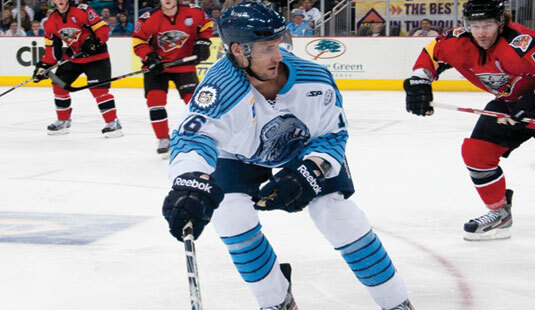 Another team losing for NHLers is the ECHL's Alaska Aces-- who lead ECHL with 57 points and will lose team's leading scorer Joey Crabb, Nate Thompson, Brandon Dubinsky, and Scott Gomez-- who has regained his scoring prowess, albeit in the minors, with 13 points (six goals) in 11 games with the Aces. The upside to the Aces is that they'll have other scorer the likes of 2nd and 3rd team leading scorers Nick Mazzolini and Garry Nunn to fall back on. The Aces also always seem to be a top talent getter in the ECHL, so a few trades could probably help, too. When you look at Europe, while the KHL will lose some talent-- the biggest hit probably will come from Switzerland, who loses plenty of talent like Patrick Kane, Tyler Seguin, Joe Thornton, and John Tavares, amongst others. That said, if there's any league in Europe who got more exposure than the KHL, it'd be the Swiss National League. Not only did they get some bigger name players, but they showed them off in their Spengler Cup tournament and showed that they could be a nice side option for older players who cannot find a place to play later on in their careers. While there were plenty of players who will need to come back to their NHL clubs, at least a good hunk of them did get some playing time somewhere else. That should make the transition from lockout to mid-season start a little more easier, especially for the fans watching. It'll take little time for rust to be knocked off and will show how well the condition is for all the players coming back. 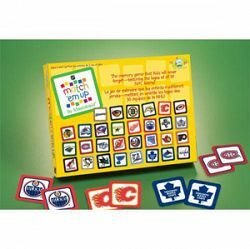 This week's AGM is a guy who actually has a record with one of the greatest organizations in the NHL. However, since it was in the pre-Original Six days, he's rarely mentioned or even thought about. Though he played under 100 games for a bad franchise, he left what he could on the ice. This week, the profile of Clarence "Dolly" Dolson. Dolson started his career with the Galt Garrison in the 1915-16 season, going 3-3-0 in six games before not having any records until the 1919-20 season with the Galt Terriers in the OHA, where he would play until the 1922-23 season. Dolson then moved into the OHA-Senior league, playing for the Stratford Indians starting in the 1923-24 season, where he would go 9-2-1 in 12 games, then 3-1 in four playoff games. With the Indians in the 1924-25 season, Dolson played in 20 games and finished with a 12-8-0 record, then posted a 1-1 record in two playoff games. The 1925-26 season was a shabby one for Dolson, going 6-13-1 in 20 appearances, while getting a call to play for the Montreal CNR, going 1-0-0 in both the regular season and playoffs. The Canadian Pro League came calling for Dolson in the 1926-27 season, as he played for the Stratford Nationals and go 19-11-0 in 30 appearances, but went 0-2 in the playoffs. Back with the Nationals for the 1927-28 season, Dolson went 24-12-5, with 11 shutouts, then 4-0-1 in the five playoff games he played. 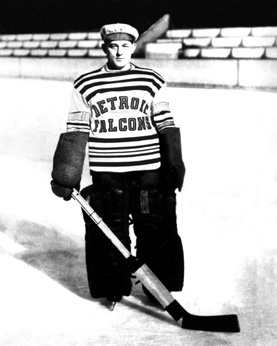 With those impressive showings, Dolson got a NHL call and was claimed by the Detroit Cougars in the 1928-29 season and played in 44 games, posting a 19-16-9 record with 10 shutouts and a 1.37 GAA (still a Cougars/Falcons/Red Wings record), then went 0-2 in the playoffs. The 1929-30 season had Dolson only play five games with Detroit (0-4-1) before being sent to the International American League's London Panthers, where he would play 31 games. The Cougars would change their name to the Falcons and Dolson would be back up with the team in the 1930-31 season, playing in 44 games and posted a 16-21-7 record. The Falcons would move Dolson to the International American League's Cleveland Indians for the 1931-32 season, going 2-9-3 in 13 games, then play another ten games in the 1932-33 season before retiring from the games. Dolson's whereabouts after hockey are unknown to where I looked, but he did pass away in August of 1978. He wasn't a big name or someone that's much remembered, but Dolson left his mark in a short career. However, in a time where jobs were sparse and it was all about proving yourself on a nightly basis, Dolson was lost in the fold. While his Senior and Minor career was decent, he couldn't hang in the NHL for too long with a team that was very disorganized until they became the Red Wings. 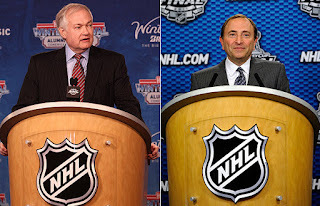 NHL Lockout Over; Now What?? Alright, well, the NHL Lockout is over. What does that mean?? Well, plenty. In a 50 (or 48) game season, it'll be a big rush for them to get to the playoffs. If a team gets on an extended losing streak, it could be curtains for their playoff hopes. These games will benefit teams who had a lot of players playing in the AHL or Europe because they won't have to shake off the rust. On top of that, it'll show how good the condition is, which means we could have a lot of injuries because of the short season. Even before that, when the CBA is ratified; it'll be a rush for trades and signing free agents, especially restricted ones. It'll be a chance to see who gets bought-out for the 2013-14 season and to see if there's going to be quick chemistry between the new free agents with their teams in a short season. The biggest things is whether the fans will come back or not. You see a lot of people who have mixed emotions on social media, many saying they won't come back. While I think the hyperbole of some is a little extreme, there's going to be some who have their interest of the NHL drop off because of this and that's to be expected. However, you can take the fan out of hockey, but you can't take hockey out of the fan. Most people will come back in some way, shape, or form, thus ending their arbitrary stand-off with the NHL. How the NHL gets fans back will be interesting to see. While the NHL itself doesn't have the ruling power to dictate ticket prices or concession prices, they will need to somehow make the game a little more accessible, maybe urge the member teams to do something in order to get people back in the seats. Rumors of free Center Ice could be a good start, but who knows how likely that is. The NHL is back. That's really all that matters. The battles can happen on the ice rather than off. 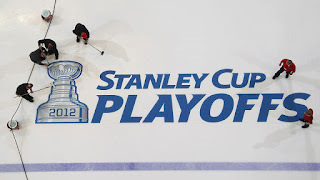 With word of the NHL and NHLPA possibly looking at a 20-team playoff when play finally returns leaking out-- the social media people came out in droves and questioned the audacity of such a thing, that this outside the box thinking is something that shouldn't be even considered. Of course...it was considered since Elliotte Friedman wrote about it December 2011 and then Dave Hodge kept the idea rolling in March 2012, but that wasn't 2013 thinking!! In any case, the idea is something that Friedman threw out about the 20 teams being grouped into one, then having seeds 13-20 playing in some kind of play-in series or sudden death game in order to join the other ten teams in the march to the Stanley Cup, Whether or not it's like the QMJHL and they do a 1 vs. 16 and say the hell with the conferences is to be decided, I'm sure. Again-- this is just outloud thinking and not set in stone as many would think. The main ideal is to bring more revenue to the teams, which goes to the league, which then gets shared with the players. When you lose half a season, you have to find a way to get that money that you lost back in some capacity. Plus, when you look at what happened with MLB and their play-in Wild Card games-- it could be something that is right in Donald Fehr's wheelhouse. When all is said and done, it probably won't happen, but thinking outside the box isn't a horrible thing. 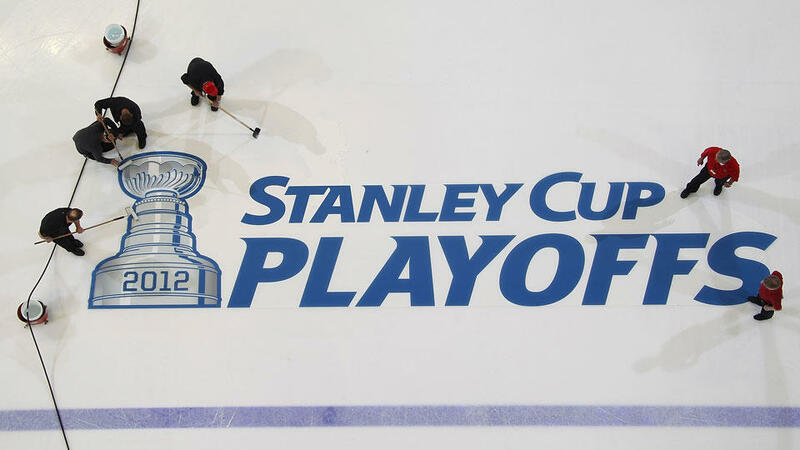 The more drama the playoffs bring the better it is for the game and the casual fan. Of course, the "traditionalists" will all be opposed to it, much like they were many other innovations and stuff like that. In a game that has had more changes over the past couple decade in their rules and technology than most any other sport-- the term "traditionalist" has to be in quotes or else those who call themselves that could have checked out of the game years ago. For me, when you have 30 teams and 66% of the teams get into the playoffs makes the league look more farce-like than the lockout had us believe. The best idea is to either bring in two teams or get rid of two teams and then have four divisions, have the playoffs start with divisional play and then the two divisions in each conference play to win the conference, then to the Stanley Cup-- much like the old days of four divisions. Of course-- when you bring up expansion or even contraction-- people get all into a tizzy. Nothing can go right for the NHL, especially not in the state they are in now. The fact of the matter is that rather than tinkering with the playoffs-- they need to have a season in order to get to the playoffs. And even after there's games-- make sure you exhaust all your research and tools in order to make sure that 20 teams in the playoffs is a great idea for the game rather than for the revenue it could bring in.